The British cavalry that landed in the Crimea in 1854 was far from a perfect war machine. Certainly it looked spectacular, but for four decades Britain had not been involved in any sizable war, and the various colonial actions were scant training for what was to follow. Worse yet, there had been very few exercises of any size, so while both officers and men were well trained and brave they were inexperienced, and that was to have unfortunate consequences in the Crimea. The light dragoons had two regiments in the campaign, the 4th and 13th, and these performed all the usual light cavalry duties, but their most famous episode is their involvement in the ill-fated charge of the Light Brigade, when many men and most of the horses were lost in less than an hour. The usual Strelets policy of all-different poses delivers 12 figures which cover a range of activities pretty well. Certainly the charge is uppermost in the mind when considering these figures, but some, such as the man resting his carbine on his leg, are clearly engaged in something much less frantic, which makes the set much more usable. The poses are generally excellent, and include a favourite with many companies - a man reaching across his chest preparing to strike to his right. In this case the pose is much better than those that proceeded it as the sword blade is separate, thus allowing a much more realistic posture and an excellent figure. The officer (the one wearing the peaked forage cap) is interesting, firing his pistol to his left, and the third man on the bottom row is intended to be on the falling horse as he lurches forward, making a very convincing model. Only the man waving the flag spoils the party - it's not a great pose and in any case the regiment's colours were never taken to the Crimea, so he should either be binned or have surgery to fashion something more useful. 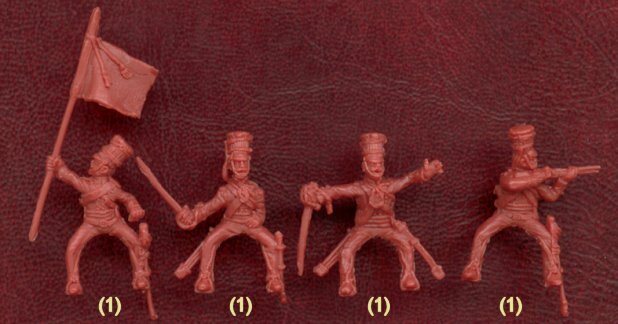 The uniform of the Light Dragoons has been correctly represented in all respects on these figures, including the foul-weather covers on their shakos and the cap-line to keep them from being lost. The officer alone has been given a sabretache, which is correct, and his peaked forage cap is also accurate. The trumpeter is correctly blowing his bugle while his trumpet, used for camp signals, is slung across his back. He also wears a pouch belt, but there is some doubt as to whether this is correct, partly because it would be awkward as he also had to carry his instruments. Finally, all the men have been armed with a carbine, which was attached to the pouch belt when not in use. The horses are exactly the same as those found in the Strelets set of British Lancers. They are nicely done, and most of the poses seem reasonable, but we have some doubts over some. The saddle and other kit is all correct, even down to the brass decoration under the throat of each animal (the horses for officers have a plume next to this). The falling animal is great, and adds drama to the collection, but the variety of poses allows great flexibility in arranging these figures. None of the horses have the valise, which was not with the troops during the crucial first months of the war, so overall we have no problems with historical accuracy here either. The sculpting of this set is at least as good as anything Strelets have yet done. While the trademark roughness is still here it is only really apparent when the figure is placed next to one from one of the biggest companies such as Italeri. Detail is good and clear, and there was no flash at all. The single extra piece, the previously mentioned sword blade, fits the figure pretty well, and the men also fit their horses well. So, not withstanding the slightly rough style, useless standard bearer and the doubtful horse poses, this is a very usable set with a lot of good qualities. Another fine product from this most prolific of manufacturers.